This miniature from British Library MS Royal 17 D. vi, f. 39v depicts Hoccleve presenting the Regiment to a young Henry V.
When D.C. Greetham and his original team planned the critical edition of the Regiment of Princes, they decided to attempt to emend their copy texts of the Regiment with the help of a computer-aided concordance of the lexical and orthographic choices Hoccleve preserved in his three autograph manuscripts. 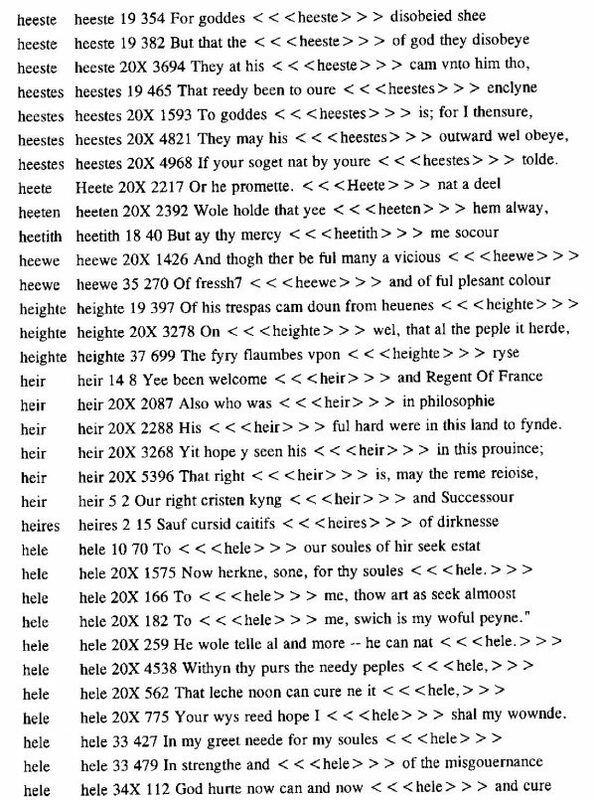 Greetham discusses this literary analysis and software development project in his 1985 paper Normalization of Accidentals in Middle English Texts: The Paradox of Thomas Hoccleve. 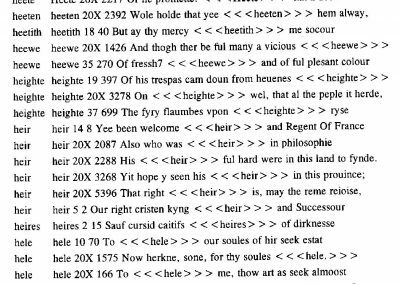 The choice to emend the Regiment using the Hoccleve Lexicon concordance was preserved by Charles Blyth in his 1999 TEAMS edition of the poem (see his introduction, pp.17-26, here). 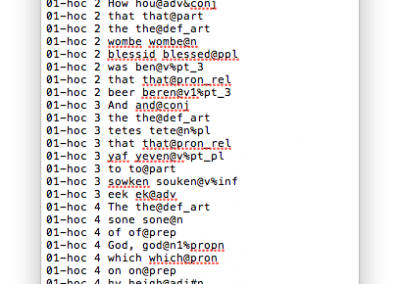 While the software that originally generated the Hoccleve Lexicon concordance and the known print-outs of it have been recycled, the raw data files that were used to generate the concordance survived in Charles Blyth’s collection of Hoccleve resources. These data files provide immensely detailed transcriptions of Hoccleve’s autograph verse manuscripts: Huntington Library MS HM 111, Huntington Library MS HM 744, and Durham University Library MS Cosin V.III.9. These transcriptions capture details in the manuscripts at the level of individual words and parts-of-speech. 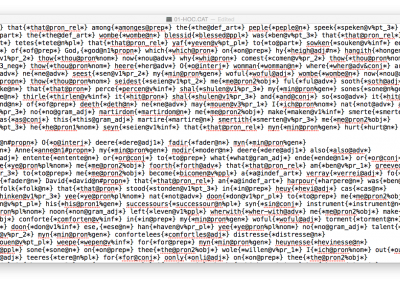 There are two styles of files for each of the 39 poems in the holograph manuscripts: 1 word per line (WIN) and 1 line per line (CAT). 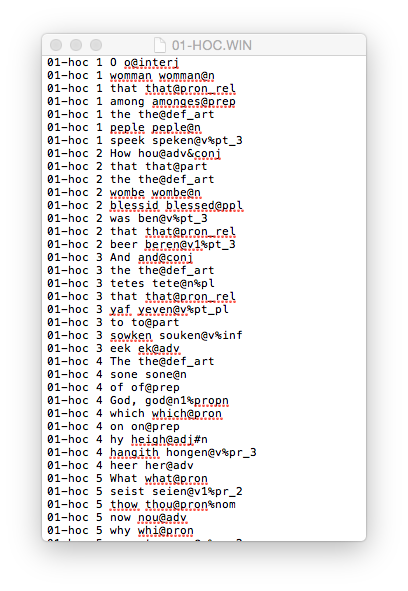 The custom piece of software for which they were originally formatted is now unknown, but Blyth thinks it may have been used by Larry Benson for an aspect of the Riverside Chaucer. Whatever it was, it was able to parse the data files to produce a print-out that listed all instances of a word in Hoccleve’s autograph manuscripts, comparing regularized forms with his orthography, marking the word with a code for its part of speech, and printing the line of poetry in which it occurs (and indicating the poem in which the line appears with a numbering system). Graduate Student Innovation Fellows from Georgia State University reformatted the original WIN and CAT files as plain-text files, and they will soon be made available at our Texas ScholarWorks Repository HERE. The team, led by Robin Wharton, converted these files into TEI-compliant XML (available on github here) and produced a prototype digital edition of the holograph poetry on this very website. This edition has built-in access to the Hoccleve Lexicon. To access the HOCCLEX data, simply right-click on any word in the edition.